We love our dogs, but what we may not love is the task of clipping their toe nails. 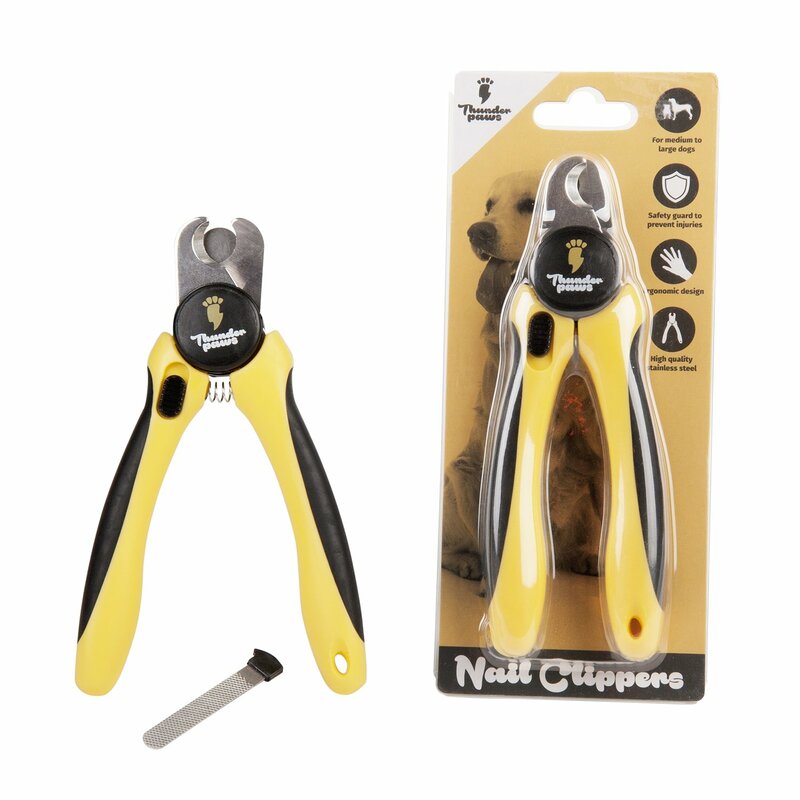 On Nolongerwild.com we have some simple pet toenail clipping facts, guidelines and the best dog nail clippers on the market today to help you complete this job with confidence and ease. 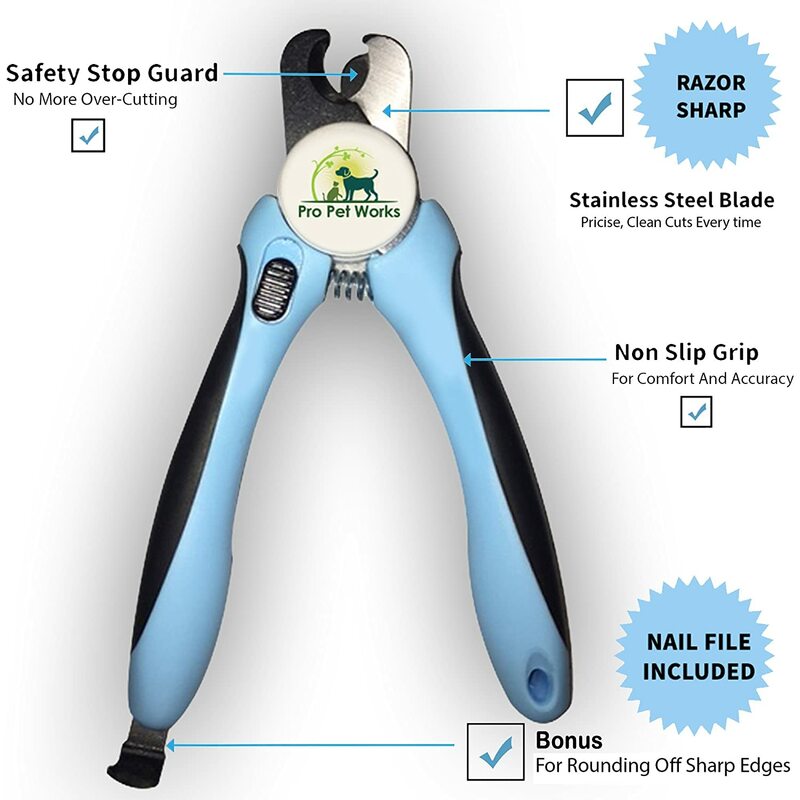 This guillotine-style dog nail clipper is recommended by veterinarians and professional groomers for its clean cut and ease-of-use. The sharp blades ensures you are getting a clean cut every time, which will save time on recutting or filing down of the nail. The stainless steel blades and ergonomically designed rubber handle fits well into the hand and won't easily slip away. 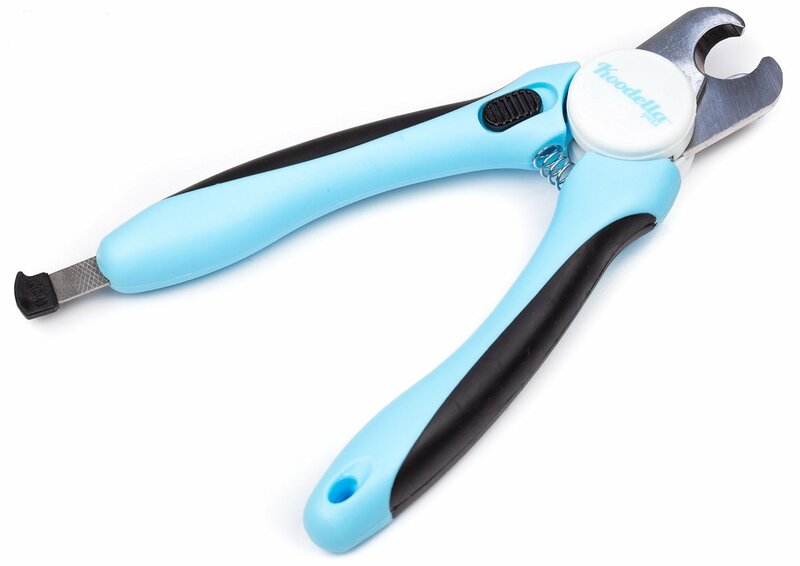 These veterinary-grade dog toenail clippers use only the finest materials, which will make toenail trimming comfortable and safe for your canine companion. The angled head and ergonomically designed rubber-grip handles will ensure a strong grasp on the unit as you trim your dog's nails. 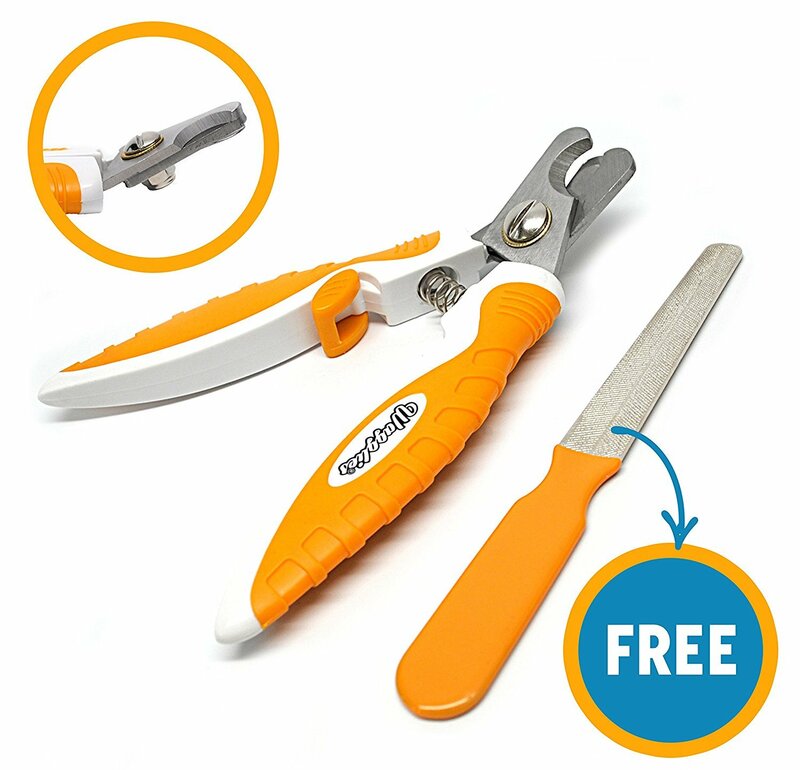 The rust-resistant and sharp stainless-steel blades will quickly cut any type of nail and the sensor guide prevents you from cutting into the quick. 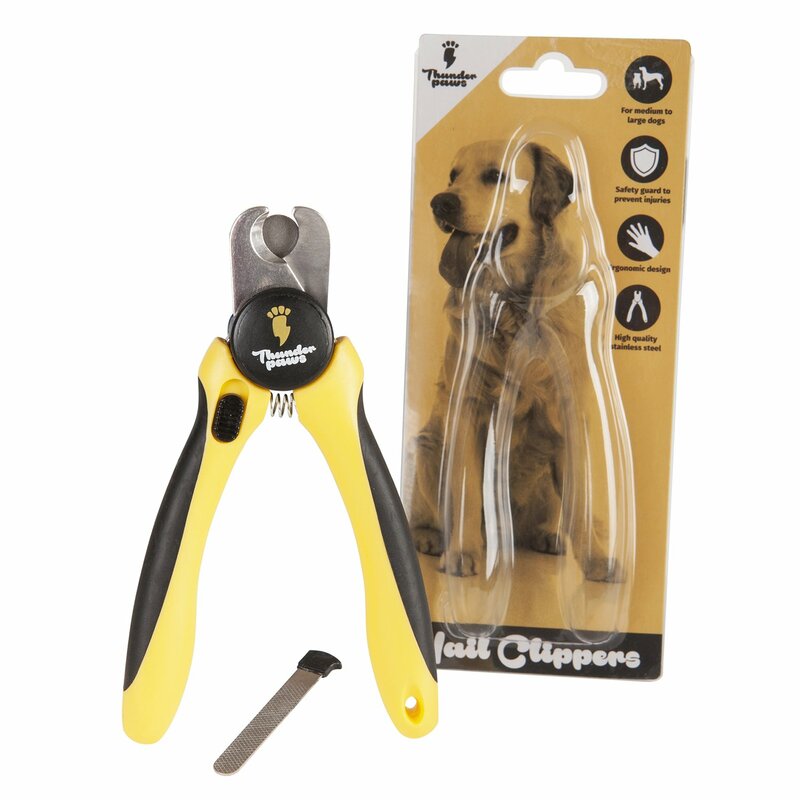 These dog nail clippers are built-to-last. They feature stainless steel blades for precision cuts and a safety lock to secure the blades in place making them safer to handle; especially good for households with curious children. The built-in safety stop guard prevents you from accidentally cutting into the quick and the strong durable and ergonomically designed handle will prevent any unnecessary drops. 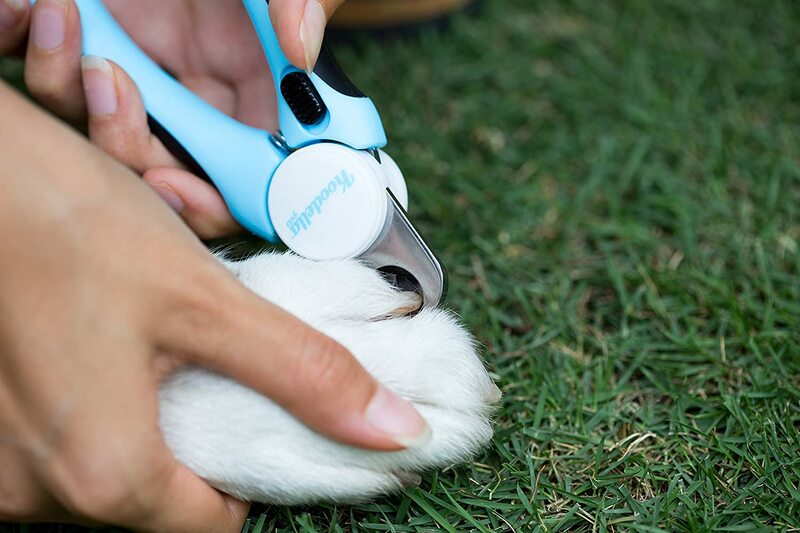 For pet parents that want to avoid the "clipping" process altogether, the INNOPAW company has one of the best nail grinders. This process uses an emery wheel to safely "shave" down your dog's nails to avoid those deep cuts that could cause your dog's nail to bleed. 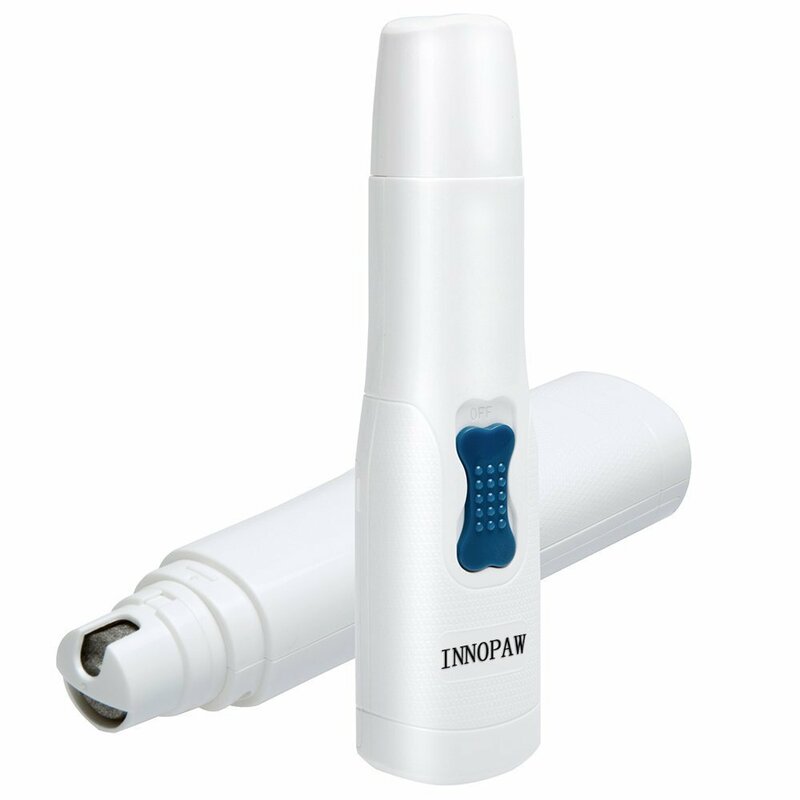 This unit comes with three separate ports; 1 for small dogs, 1 for medium-large dogs, 1 for fast wearing nails. The compact, yet comfortable design makes grinding your dog's nails easy and safe. In our number one spot for best dog nail clippers is the Pro Pet Works Nail Clippers. This unit has many features we think pet parents will find pleasing. First off it comes highly recommended by professional groomers, trainers and veterinarians. The stainless steel blades offer a clean cut while the quick guard sensor will help you avoid any unnecessary pain to your pooch. In addition, the Pro Pet Works Nail Clippers also offers a built in nail file for getting that extra smooth nail - no more nicks or scratches when Fido gets a little to rambunctious. The handle is designed to fit perfectly in your hand with a non-slip surface to ensure you will have a secure hold on the clippers themselves. These clippers will pay for themselves each and every time you save the cost of those grooming fees for your dog's nails. Why Do I Need to Clip My Dog's Nails? There once was a time (decades ago) that pet owners didn't worry much about their dog's toe nails. This was mainly due to the fact that dogs were more prone to being outdoors, running on various hard surfaces that kept the nails naturally worn down. Today, many dogs lead a more sedentary life being kept indoors for long periods-of-time when their pet parents are at work. When they are let out the surfaces they encounter tend to be the softer touch of the grass. In this type of situation, your dog's nails will continue to grow, so they will need to be trimmed back. When the nail's constantly touch the floor/ground, it forces the dog's pressure back into the nail bed. This is like wearing a pair of shoes that are way too tight. Once the dog's feet become sore, it makes it more difficult to handle the paws to clip the nails back. 1. Not conditioning or desensitizing the dog to getting its nails trimmed. The best way to avoid hassles is to get your puppy used to having his nails trimmed at an early age. 2. Impatience. Rushing the process and not allowing your dog to go through this procedure at his own pace, will create fear and anxiety. Forcing the canine to have it done. Don't cut into the bloodline (quick) because it can cause the nail to bleed and pain to the pooch. 3. Holding your pet down, once again creates a fear-based reaction, no matter how fast you trim those nails. 4. Not rewarding good behavior. After the nail trimming is finished, give your dog a treat, even if he was struggling and yelping. 5. Cutting into the bloodline (quick) causing the nail to bleed and pain to the pooch. It's better to gradually trim the nails back, doing it more often, than to cut into the bloodline. Cutting your dog's toenails doesn't have to be a scary and stressful situation. Here are some helpful tips shared with us by Dogs Naturally. As we mentioned earlier, desensitizing your dog to the process of nail trimming is the best way to avoid all the drama. To do this you will want to handle your dog's paws often, this includes feeling between the toes and pushing on the nail beds to extend the toenail out. Once your dog is familiar with your handling, introduce the clippers to him, but don't clip. Praise and reward him for a job well done each and every time you follow these steps. 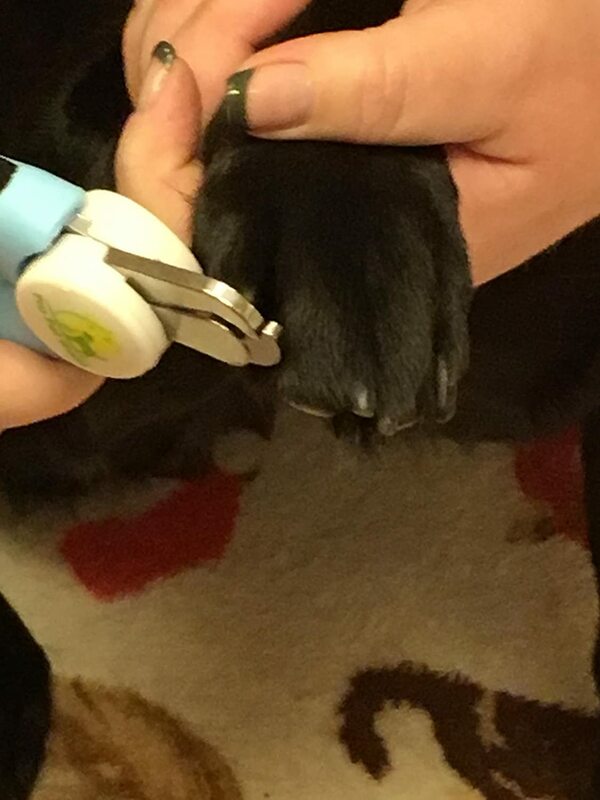 There are many different dog nail clippers on the market today (which we will review next) so finding the right one that works best for you and your dog is paramount. Many of these toenail clippers have "guards" on them which doesn't allow you to cut past a certain point. These work great for pet parents who are unsure of how far to cut into the nail. You may have to try a few different models to find the one you and your pet are comfortable using. Holding onto your dog's paw firmly, but gently, cut the nail on a 45 degree angle, using the guard as a guideline. Take off small amounts at a time to avoid cutting into the quick. Step 4 - Look for the "Dot"
Inside your dog's black toenails, there is a "dot" or pulp that will tell you when to stop cutting your dog's nail. This dot will start out white or light-in-color and will get gradually darker the further into the nail you go. When this "dot" is gray or black-in-color, stop cutting as you are getting close to the quick. Tip: Always have cornstarch or a blood-stop product on hand in case you accidentally cut too far into your pup's nail. This YouTube Video shows how to cut your dog's toenails. 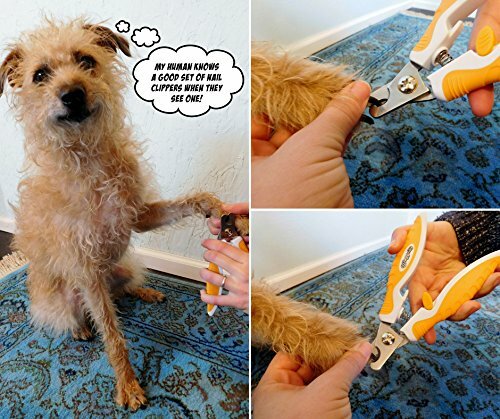 Stop being nervous about clipping your dog's toe nails. Follow our helpful tips and professional advice to save yourself time and money. Desensitize your dog to having his paws handled, have patience, give lots of praise and treats and, of course, find the best products for you and your pup. Before you know it, you will be trimming those nails like a pro. But watch out, you may end up doing all the doggy nail cutting of your friends and family's pets.